Southeast Red vodka gang,A liquor company is cashing in on gang rivalry in San Diego by launching a controversial brand of vodka that maps the city's gangs on its label. 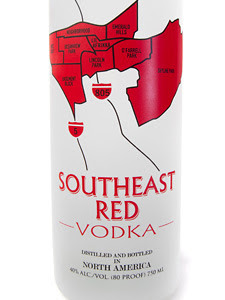 The vodka, named Southeast Red, is flying off shelves at liquor stores in the area. But it has sparked outrage among locals who claim it will stoke tensions between the groups and is 'a disaster waiting to happen'. San Diego has a long-running gang problem, with the area responsible for seven of the 13 deaths attributed to gang violence in the U.S. in 2011, according to UTSanDiego. The label's map divides the southeastern region of San Diego into neighbourhoods claimed by documented gangs, all bordered by interstates 5 and 805 and state routes 94 and 163. Community leader and founder of neighborhood group 100 Strong Mario Lewis called it 'disgraceful' to 'portray a community in gang-banging terms'. Bishop George D. McKinney, of St. Stephens Church of God in Christ told CNN: 'I do not believe it to be a compliment. Local bottle shop owner Kay Howell said the vodka has brought a lot of customers to her store. 'People are buying it just for the bottle and sending it to their friends on the other coast,' she told UTSanDiego. Greene Cat Liquor said they no longer sold the vodka after a neighborhood market association asked them to stop, but they still gets calls asking for it. The communities from left to right are listed as West Coast, Oceanview Park, Basement Block, Lil Afrikka, Lincoln Park, Emer- ald Hills, O’Farrell Park and Skyline Park. The map is in red, a well known gang color. According to the label, the vodka is distilled in North America and bottled by Neradi3, a company based in Lakewood, Colorado. San Diego accounted for most of the gang killings in the U.S. last year. Seven men, all between 22 and 40, were gunned down between January and September, mostly in southeastern neighborhoods. The figure is up from a record low of four gang deaths in 2010 but San Diego homicide Lt. Kevin Rooney said it was still a small number for the city, which averaged 16 gang murders a year from 2006 to 2010. In February, 20-year-old gangster Josue Hernandez Gutierrez was arrested for stabbing a 48-year-old Emiliano Cortez 19 times after issuing him a gang challenge. There was no evidence that a robbery or other crime was involved. The only suspected motive disclosed by police was that it was gang-related.